Viet Nam News HCM CITY — It is time to increase the production and use of organic fertilisers to foster organic farming, according to the Việt Nam Fertiliser Association. Speaking at a national conference on development strategies for the organic fertiliser industry and organic agriculture in HCM City yesterday, Nguyễn Hạc Thúy, general secretary of the association, said: “Consumers around the world pay increasing attention to food safety and farm produce quality, while importing countries scrupulously check imported agricultural produce, especially for residues of plant protection chemicals, antibiotics, and heavy metal content. Việt Nam’s agriculture has made great strides in recent decades, with productivity shooting up to not only meet domestic but also export demand. But its challenges are increasing in the form of natural disasters, saltwater intrusion, droughts, flooding and soil exhaustion due to overuse of fertilisers. Lương Quốc Đoàn, deputy chairman of the Việt Nam Farmers Association’s executive committee, said: “It is time for Việt Nam’s agriculture to have new directions to enable it to develop more sustainably and efficiently, and organic agriculture, through eliminating the use of chemical fertilisers and enhancing the use of organic ones, is among the new directions. “Organic fertilisers are among the important factors in pushing Việt Nam’s agriculture towards organic farming. Thúy said Việt Nam produced more than 1.2 million tonnes of organic fertilizers a year, accounting for a tenth of total fertiliser demand. “With such volumes of agricultural by-products, we can produce 5-6 million tonnes of organic fertilisers,” he said. Using the agricultural by-products to produce organic fertilisers would also help reduce pollution and improve soil fertility and farm produce quality, he added. Đoàn said promoting the use of organic fertilisers remained difficult since to fertilise a similar area a larger volume of organic fertilisers is needed compared to chemical fertilisers, making transportation harder and costs higher. Besides, their impact is not as quick as that of chemical fertilizers, he said. “Despite facing difficulties in developing the organic fertiliser market, it is a vital trend and the Government should offer support through appropriate policies and technologies,” Đoàn said. At the conference, the Crop Production Department issued Decree No 108/2017/NĐ-CP on fertiliser managementto encourage legitimate producers and eradicate fake products, a widespread problem. 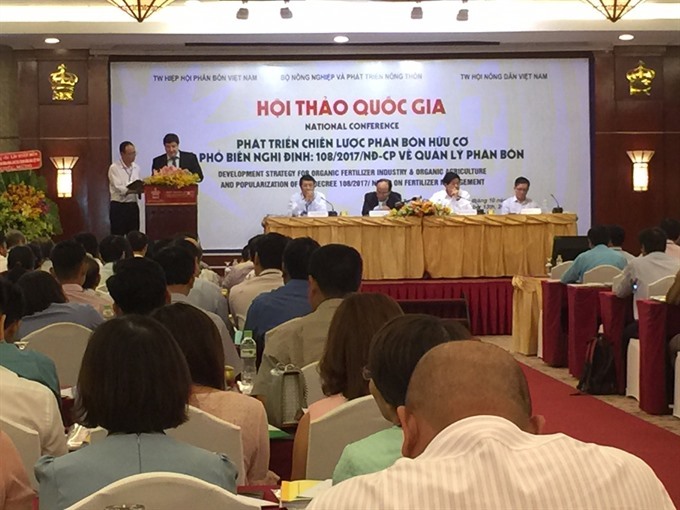 Hoàng Trung, head of the department, said the new decree was expected to address the shortcomings of the previous decree, in which many provisions have become outdated and not impracticable. The new decree would improve oversight to crack down on fraudulent companies, he said. Under the former decree, both the Ministries of Agriculture and Rural Development and Industry and Trade managed fertilisers, causing an overlap, he said. “The new decree resolves this issue since the agriculture ministry becomes the only agency in charge,” he said. The department also solicited contributions for a draft decree on dealing with violations in the fertiliser sector, which envisages increasing fines for certain violations. Posted in Nông nghiệp - Agriculture, Nuôi trồng hữu cơ - Organic farming, Phân hữu cơ - Organic fertilizer	Nông nghiệp - AgricultureOrganic fertilizerViet Nam Fertilizer Association.